If someone had told me a while back I'd be baking a Kugelhopf bread I'd have asked them how it is pronounced rather than how it is made.That was my first thought when I saw the bread bake of the month in WKtB.I mean,how does Aparna do it,month after month?Choose a unique bread and shake us out of our comfort zones?I should have taken her word literally when she said we'd be baking different breads for each month of the year. For someone whose baking was limited to sweet bakes,I am taking baby steps in savoury baking as well now.I'd put off baking savoury muffins fearing it wouldn't match my expectations,I think I should rethink about it now.Anyway,to play it safe I halved the recipe,still it made a decent quantity of bread.So,if you are a savoury bread fan go ahead and bake the full recipe. Kugelhopf (also spelt as Kugelhupf, Gugelhupf, Gougelhof, Kugelhoph, Kugloff Kuelopf, Kouklouf, Köjlhopf, Koejelhopf, Koïlopf, Köjhupf!) is a yeasted sweet cake well known in the Alsace region of France, as well as in Germany, Switzerland, and Austria, and variations of this are also found in some countries of Eastern Europe. This bread/ cake contains eggs because they are a characteristic part of this bake, but feel free to substitute powdered flax seed for the eggs if you don’t eat them. You may also use sun-dried tomatoes and toasted pine nuts instead of the tomatoes/ bell pepper and walnuts.I used Cheddar cheese as per Aparna's recipe as well,but you can use a cheese of your choice.A sharper cheese would taste better. 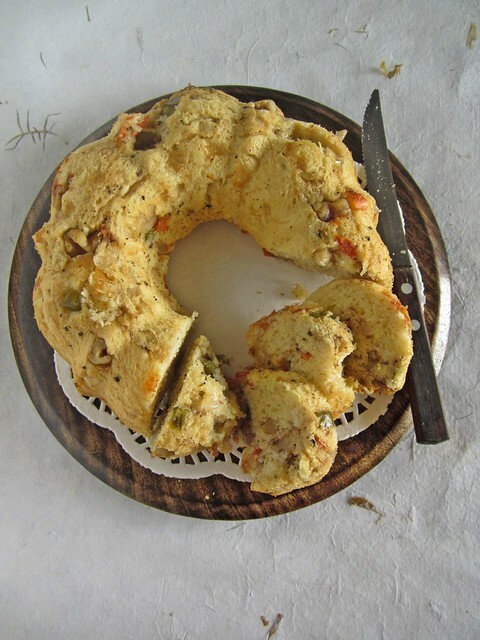 This Kugelhopf bakes in an 8” Kugelhopf pan, but you should also be ableto bake it in an 8” Bundt pan, a regular loaf tin (or 2 small ones), smaller Brioche tins or even muffin tins. If you’re baking this in muffin tins you might want to use half the recipe, though I understand that this bread freezes well. I used a food processor to knead the dough but this can be done by hand but it will be a bit sticky to handle. Put 3 cups of flour, yeast, and salt in the bowl of the processor. Pulse a couple of times to mix. Then add the butter, a little at a time, and process till incorporated. Add the warm milk and process till mixed. Now add the eggs and process till mixed. You will now have a soft and sticky dough. Knead some more, adding more flour, a little at a time and just enough till the dough pulls away from the sides of the bowl. Do not be tempted to add more flour than absolutely necessary. In the meanwhile, heat 1/2 a tsp oil in a pan. Add the chopped green bell pepper, the tomato and a pinch of salt and stir-fry till the raw smell disappears but the vegetables are still crisp/ crunchy. Remove and keep aside. To the same pan, add the remaining 1/2 tsp oil and sauté the onions with a pinch of salt till they turn golden brown. Remove and add to the bell peppers and keep aside. Grease an 8” kugelhopf mould or bundt pan well especially around the centre (or whatever pan/ tin you plan to use). Place some of the chopped walnuts in the bottom of the mould. 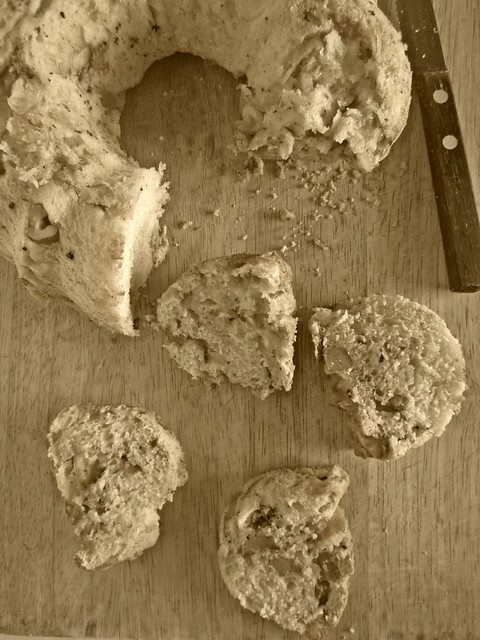 If you’re using a loaf tin or brioche moulds, then don’t do this. Instead press in the walnuts on top of the dough after the second rise, just before baking. Once the dough has risen, deflate it. Then work the cheese, stir-fried onions, bell pepper and tomato, the remaining walnuts, black pepper and thyme into the dough. The best way to do this is to flatten the dough out and spread all this over the surface, fold the dough over and then knead it. This will ensure a more uniform incorporation of the “filling”. The dough will be a bit sticky, so use a scraper to help you with the kneading. Do not add more flour! Unmould the Kugelhopf and let it cool on a rack. Slice and serve. 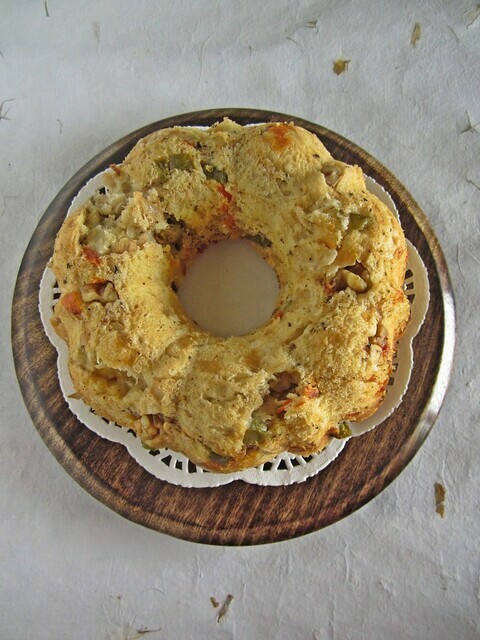 This Kugelhopf should serve about 10 people and is also good for breakfast, as a snack or served with a simple soup. yummy bread with awesome clicks. The Bread looks delicious with all those stuffings inside. Even I am still struggling to pronounce the name of this bread. I will try this some time. 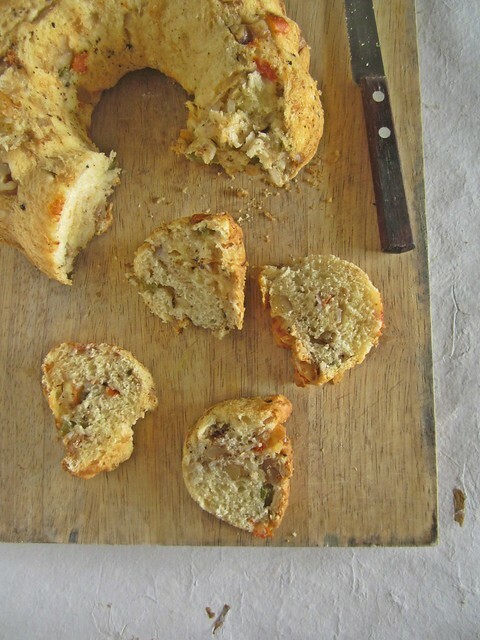 Wow.. Yummy savory bread.. I wud love to bake one some time !